Over its tenure, Naruto has done some mind-boggling things with its Sharingan. 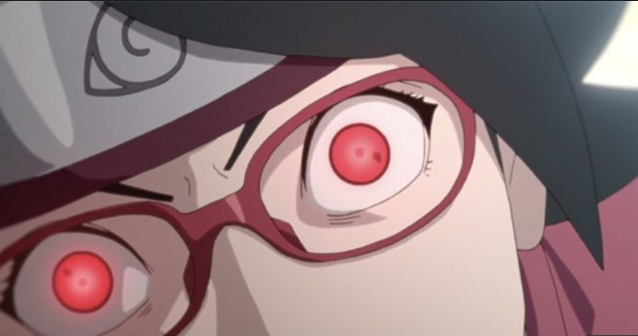 As the pride of the Uchiha clan, the power has caused more trouble than not for its wielders thought that doesn’t mean the Sharingan is a bust.When it comes to fighting, the doujutsu is a powerful one to wield, and Sarada found a new way to use her Sharingan to her advantage just recently. Over the weekend, Boruto: Naruto Next Generations went live with its newest episode, and it caught up with Sarada. The heroine found herself pit against a genjutsu specialist with Boruto in tow, leaving the genin out of their wits. In fact, the pair were put under a technique forcing them to fight to the death, and Sarada nearly met her end by Boruto’s hand before she pulled off a rather impressive Sharingan swap. With the genjutsu vixen have fled, Sarada and Boruto were forced to try and kill each other with swords. One wrong move sent the girl’s weapon flying and gave Boruto an opening. As his sword came down to strike Sarada’s head, the girl managed to catch her reflection in the blade, and that window of time let her cast a genjutsu on herself with her Sharingan. What happens what a genjutsu meets a genjutsu? Well, it looks like a whole bunch of cancellations go down as Sarada knocked herself out of her first genjutsu and managed to release Boruto from his.she reflected her Sharingan in there and put herself under a genjutsu to disrupt the chakra. To be honest, that was close,” Sarada told her that teammate after the fact, explaining how she escaped their opponent’s trap.